Last-minute hotel booking mobile app Hotel Tonight has had a pretty big year. In addition to expanding outside the U.S. to Canada and the U.K., the company scooped up another $23 million in funding. With its localization efforts in full swing, and its team rapidly expanding, CEO Sam Shank is steering the company toward another important goal: improving the app’s personalization features for individual users. On Tuesday, the company is rolling out a new design of both the iOS(s AAPL) and Android(s GOOG) apps. One of the design changes with this goal in mind is an important first for Hotel Tonight: it’s dipping its toes into user reviews. This is significant because the premise of Hotel Tonight has been to present you with a short, curated list of hotels the company recommends. By adding just a basic rating, in the form of a thumbs up or thumbs down (no long-winded written reviews) the company is giving users more subjective information about that hotel and whether they should pick it. But don’t worry, there’s not going to be very many poorly rated hotels on the list. The average score is 91 percent, and Shank says if a hotel’s user ratings fall below a certain threshold, Hotel Tonight will stop working with them. It’s data the company has already been using for this purpose, but is now making it public and useful for users. Starting Tuesday, the app will begin to customize the first hotel options it shows you based on picks you’ve made in the past. For example, if you open up the app in New York City, among the top hotels you’ll see first on the screen is the hotel that’s closest to you at the time, and two local hotels that are similar to the type of place you’ve stayed at before. If you usually stay in “hip” or “basic” hotels, the app will show you those kinds of places first, for example. Using the thumbs up/thumbs down user reviews, the app will also show you hotels that users like you have picked. Hotel Tonight is using a similar methodology to what Amazon(s AMZN) has been using for years to recommend products, the “people who like this, also like that” approach. “We’ll start showing you stuff that’s relevant to you personally,” said Shank. Among the top few hotels on a city’s page, “not everyone will see the same three things,” he added. I like the idea of giving users more signals as to whether a hotel is good or bad. Sometimes I do too much research on hotels in the app because I want to make sure that users similar to me like a place as much as HT’s staff does. With user percentage ratings and recommendations based on past places I’ve stayed, I think this will keep users in the app and help them make decisions faster. I think the idea of a hotel that falls below a certain rating will be dropped is a good one but ratings as we have learned can be spoiled by unscrupulous competition who wish to see another hotel fail. This will surely have to monitored carefully, good app though! 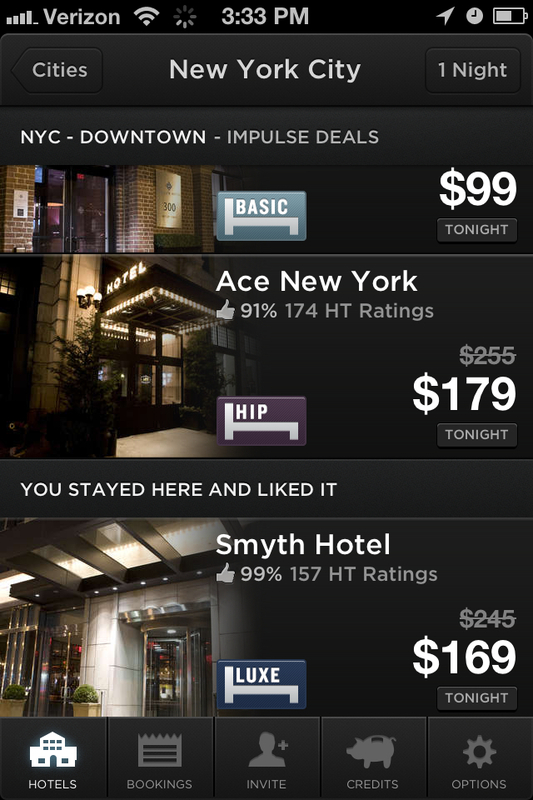 HotelTonight has always had 3 “impulse deals”. With the new app release there are now additionally up to 3 more spots that are not discounts, but are personalized slots based on your location or past booking habits. These hotels show up below the 3 impulse deals that the app has always had. I think you have a bit of confusion in this article.